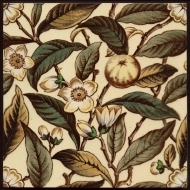 Sherwin & Cotton were one of the greatest decorative tile makers of the late nineteenth and early twentieth centuries commencing in 1877 and selling up to Johnsons in 1911. One of the most prolific designers especially with its famed art director George Cartlidge with a vast range of designs in numerous techniques some of which were exclusive to themselves. They made many tiles especially for the fireplace market with a wide range of five-tile panels and 6x12 for panel centrepieces. Famed for George Cartlidge's 'photographic' tiles they were true art tile manufacturers, the most often found tiles in original frames as objéts d'art rather than to enhance a larger piece are from the company. They used many unique processes that others tried to imitate but could not reach the heights of the company, it was the first manufacturer to produce barbotine tiles in any quantity. A great part of the beauty of their wares is their most brilliant glazes, intensely coloured yet the most translucent of all the contemporary manufacturers, without the glazes George Cartlidge's émaux ombrants tiles would have been similar to those of other companies. Compare with other companies embossed figural tiles, tile specialists like Craven Dunnill, famed manufacturers like Mintons and Sherwin & Cotton's are unique. The other companies had to make their tiles more embossed, less delicate, to utilise the tremblay effect of majolica glazes, none match those from Sherwin & Cotton. In many ways more arts and crafts than those companies who have gained such reputation, whilst Morris & Co.'s tiles were either decorated overglaze so subject to wear and not really fulfilling a basic requirement of tiles, durability, or dutch made imports often with copies of islamic patterns, George Cartlidge as art director both designed, manufactured and worked with the technologists of the company to devise the processes to bring his aspirations to reality.